Be sure to scroll down after the program description and Roz's art to read Roz's interview with Colleagues Program Director Jean Formo! We improve and deepen our art when we build a daily practice. The visual journal provides an excellent, user-friendly tool for enriching your daily practice. Life-long journal keeper Roz Stendahl will lead you on an exploration of the ways in which a visual journal allows you to create a balance between play and skill development while it anchors you in the present moment. Visual journaling demands that you hone the observational skills every artist depends upon, yet at the same time a daily practice incorporating a visual journal allows you to create a record of your life and growth as an artist. Our program will include many visual examples, along with Roz’s real, live journals which will be handled carefully with cotton gloves. You are invited to bring your own artist journals to this event. Please note that our speaker has allergies that prohibit the wearing of fragrances. Also, please do NOT bring any Sharpie marker products! Roz Stendahl is a graphic designer, illustrator and writer who has worked in publishing for over 37 years. Her teaching experience with adults and children includes writing, literature, journaling, book arts and digital arts. Her art work has been widely exhibited. Her visual journal work appears in Making Journals by Hand, by Jason Thompson; The Creative License, An Illustrated Life and An Illustrated Journey by Danny Gregory. Roz is a signature member of the Minnesota Watercolor Society. She founded the MCBA Visual Journal Collective in 2008, for book artist/journalists. She has been the catalyst for other groups who continue to create art together in the Twin Cities — the Minnesota State Fair Sketch Out, and the Bell Museum Sketch Night. Visit Roz’s website at rozwoundup.com to learn more about her work, class offerings, and commissioned work. 1. Any memories of your childhood art? I remember everything about my childhood and my childhood art so this is a pretty broad question. I loved drawing and writing. My mom gave me my first journal when I was 3 and 1/2 years old and told me to go observe. (She wanted me to be busy and out of her hair.) It was a lovely watercolor journal from Holbein. We were in Japan at the time. As soon as I could read, which was about the same age—I wanted to know what was going on in books which all the adults were looking at—I also started writing. I loved both. Everything. I just constantly find myself looking around and seeing everyday things that I want to capture or explore like the fluff of a bird’s feathers in the winter cold or a shadow shape on the lawn. Painting and writing are both about noticing all those effects for me. I spend most of my day in a state of wonder, yet manage to be highly effective in getting things done. I’m grateful for that. 3. What part does expression play in your art? Might not understand this question. To me it’s total. Art is about expressing your opinions and observations, so art is finally a way to express what I’m thinking and feeling and seeing. 4. For you, what presents the most personal challenge in your work? The 24-hour day thing. I have to find some time to sleep. I’m highly organized so I have got a good handle on getting the necessary things done—necessary for life in the world (like work for bill paying, and then of course paying the bills). Because I’m so organized I have lots of “lost minutes” that aren’t lost and can be used for art. I really try to share this philosophy with my students. I have always loved pen and ink. I also really love the brush pen. (I grew up in a house full of Japanese and Chinese art so this is a surprise to no one.) I love watercolor for is transparency. I love gouache for its opacity. I love water-soluble wax crayons for the ability to be opaque and blend like oil pastels which I can’t use because of my allergies. I love color pencils because I got my first set as a child and they changed my life—fine pointed tools instead of the crayons everyone was using. I love printing so I absolutely adore rubberstamps. I like speed and ease of use so I love Montana Acrylic markers (Water-based not their solvent line) with the 15 mm tip. I can lay in a background very quickly with one of those. PAPER is one of my most important tools. I love the papers I love and use them all the time for the techniques I love to use. Mostly I like rag watercolor papers like Fabriano. I love Stonehenge, I like Nostalgie and Folio as well. Below are two links to my blog about the types of papers I like to use. Richard Parkes Bonington, William Holman Hunt, Sargent, Whistler, Homer, Anders Zorn, Charles Dana Gibson, Albrecht Dürer, Barry Moser, Beatrix Potter (her nature works, not children’s books) Walter Crane, Howard Pyle, N.C. Wyeth William Heath Robinson, Peter de Seve, Ralph Steadman, James McMullan, Nicolas Marlet (and a bunch of other folks who work in animation). 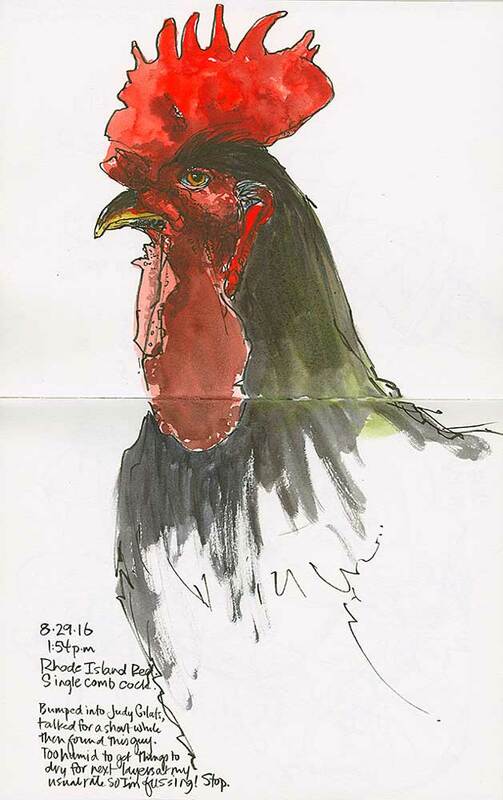 There are some urban sketchers who are doing some amazing work these days. There are some modern portrait painters I’ve recently become infatuated with but I can’t remember their names. 7. What are your artistic goals for the future? Any new directions? I don’t talk about future goals or current projects as it takes away the freshness for me. Once they get established then I can speak about them because they have momentum. I do know that in the near future I’ll continue to explore portraiture (of humans, animals, birds, and rocks—I’ve been at all those for some time, it seems to hold my interest; I think I might be still interested in them when I die). 8. What brings you joy in regard to your practice of art? The doing. I’m as happy with one messy page of struggling as I am with 10 pages that seem perfect or stunning. (Same thing with paintings.) I love working out “problems” or puzzles. And it can get messy to do that. Bring it on. I love “getting in the weeds” while making a painting. 9. What continues to draw you to teaching? I love sharing the joy I find in creative expression; the gratitude and energy it brings into my life. I also find that because I understand process I’ve been able to help students better understand their individual process and that means I’ve helped them find their unique voice and that makes me so incredibly joyful that I can’t stop smiling. 10. If you could distill your artist statement, what would it say? I’m an urban dweller who loves the natural world. I enjoy the experiments of paint that get sight and emotion onto the page. 11. What kinds of classes do you teach? I teach bookbinding, book arts (including visual journaling), drawing (color pencil, pen and ink), painting (watercolor, gouache, mixed media), creativity, color theory. I’ve had my work included in a lot of books such as Danny Gregory’s An Illustrated Life and An Illustrated Journey. Those books not only have sections of my work included, but include the work of lots of other artists working in journals and sketchbooks. You might enjoy seeing my Adjusting: P10 journal. A 3-part flip through of that journal starts at this page and then progresses through two more pieces by links at the bottom of the post. This is still one of my favorite journals.